You know you’ve made it when you have more cars than you can fit in your garage–we should all be so lucky. If you are experiencing this “problem” first-hand, can we just say that you might have a bad case of First World Problems? Have no fear, there is a way you can get all of your vehicles in the safety of your garage. If that’s not a good enough reason to get a home car lift, here’s five more for you. If you’re playing storage wars with yourself, it might be time to consider a home car lift. How you use your garage space is completely up to you, but if you want more space to do what you do, think about treating yourself. Whether half your garage is dedicated to Christmas decorations or your grown children’s old toys that you just can’t seem to part with, everyone could use more space. No one said a home car lift had to be used just for cars: go ahead and organize those boxes on the lift platform. Let’s backtrack to the original conundrum: so many cars, so little space. Why not stack them with a parking lift? Double your space and turn your two-car garage into a four-car garage. Put your weekend project cars and classics that you don’t use every day up top. Keep your daily drivers on the bottom for easy access. When it’s time to get those beauties down for a night on the town, the car shuffle is fast and easy. Wouldn’t it be nice if all your cars fit under one roof? (A roof with a locking garage door.) Save yourself from worrying if tonight is the night that your stereo system finally gets stolen. When you have a home car lift, you can “tuck your cars in” at night and lock the door behind you to keep unwanted intruders out, allowing you to sleep soundly at night. Never worry about the safety and security of your prized possessions again. Along with keeping your car safe from thieves and bandits, you need protection from Mother Nature. The last thing you need is your paint getting faded from sitting in the sun day in and day out or a fallen tree branch across the roof of your car… yikes! Another thing that is severely damaging to your paint are bird droppings, which contain uric acid. This nasty stuff is potent enough to burn through your coating of paint sealant and even start to damage the under layers of paint. Have cats in your neighborhood? They don’t care how expensive your car is; if it looks like a good place to sleep, they will. In the process of getting up on that warm hood, cats often scramble carelessly to stay up there, leaving thin, shallow scratches across your paint. A home car lift will prevent those darn cats from having their way with your car. 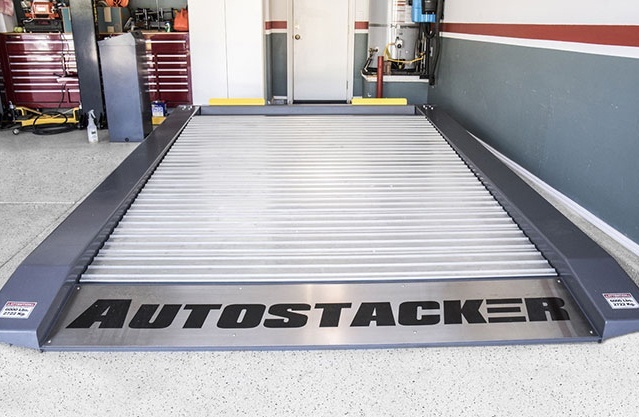 You might be thinking, “How can a home car lift save me any money?” Here’s how: now that you can stack your cars, you don’t have to dip into your retirement or the kid’s college fund to renovate or expand your garage space. Stacking your cars create a smaller footprint so there is no need to construct a whole new space. Big cities have the right idea: build up, not out. A little spent now is a lot saved for the future.